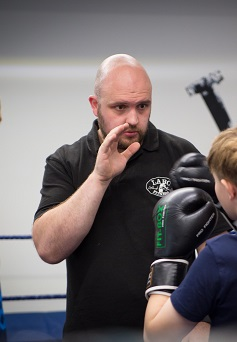 Mark founded Littleborough Boxing gym in 2012 having first graced a boxing gym 25 years ago. He has had the privilege of working alongside some fantastic coaches in the professional and amateur Ranks. Mark highlights include training a National Champion, becoming Head Coach of the North West of England Junior squad, sell out shows and helping to ensuring the club is a huge part of the community. Over the past 7 years’ Mark has seen the club take massive steps forward in becoming a club with an ‘old school’ feel to where there is something for everyone from young too old. Mark also runs the fitness classes helping everyone from all abilities and ages to reach their fitness aims. Whether it’s the bootcampers or the boxers Mark is passionate about everything he gets involved with. Louise has been practising yoga for the best part of 30 years and has enjoyed deepening her experience with classes, courses, workshops and retreats of many kinds. Louise finally undertook her teacher training with the Yoga Alliance in 2014 and since then has continued to spend much of her free time on yoga related activities, including, most recently meditation and prison teaching modules with the British Wheel of Yoga.